The Pentax Optio WG2 and WG2-GPS are waterproof, dustproof and shock-resistant compact cameras which can be used at a depth of up to 12 metres, withstand a drop of 1.5 metres, cold to -10°C and a weight up to 100kg. The WG2 and WG2-GPS feature a 16 megapixel back-illuminated CMOS sensor, Full HD movie recording, a 5x optical zoom lens with 28mm wide-angle coverage, a 3 inch high-resolution LCD monitor with 460K dots, and six built-in LED macro lights. The Optio WG2-GPS additionally comes equipped with an upgraded GPS module and is the model that we tested for this review. The Pentax WG2 and WG2-GPS officially cost £229.99 / $299.95 and £279.99 / $349.95 respectively. The design of most toughened cameras, the premise being that stills and video can be shot underwater, in the cold, or even after you’ve dropped or stood on them, is distinctly drab; they are functional tools rather than fashionable accoutrements. 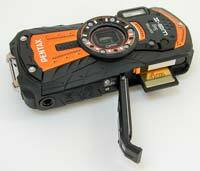 Not so the Pentax Optio WG-2 – our review sample being the version that adds GPS for £50 more. Here an aggressively angular appearance hits you like a smack in the face. To re-use an old cliché the WG-2’s styling is very ‘Marmite’; you’ll either love the ultra modern look that resembles a robot’s smartphone and appears to have boys under ten years old in its sights, or hate it. If it’s the latter you won’t even be reading this, so we’ll assume you’ve gotten past the hurdle of a camera that appears to have been dreamt up off the back of a focus group populated by sugar-high youngsters. Though the zoom here is a modest 5x optical, with a focal range equivalent to a wide (but not ultra wide) 28-140mm in 35mm film terms, in most other respects the Pentax Optio WG-2’s specification reads identical to that you’d find backing up a latest generation 20x travel zoom. So we get a 16 megapixel effective resolution provided courtesy of a 1/2.3-inch back-lit CMOS sensor (16.79 total MP), Full HD 1920x1080 pixels video (mono sound), widescreen ratio 3-inch LCD at 460k dots resolution with anti reflective coating and 170° viewing angle, plus, as we’ve noted, the go-faster chassis finds room for a GPS antenna. This not only tags image data with location info but automatically sets the built-in clock to match said location. In combination the above features signpost this one as a travel camera, and one for active travelers at that. 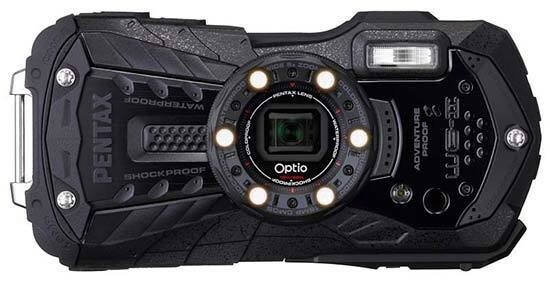 If diagonal lines, arrow-head edges and bright sporty colours alone didn’t already suggest this camera was a different beast, the industrial faceplate screws plus lockable covers for the HDMI port and joint card and battery compartments indicate that the WG-2 is tougher than most. Ready for ‘active’ use and squaring up against the likes of the Olympus TG series, Canon PowerShot D20, Fujifilm Finepix XP50, Panasonic Lumix DMC-FT$ and FT20, plus Nikon Coolpix AW100 this Pentax is claimed waterproof, shockproof, crushproof and freeze proof. Shirking destruction, the WG-2’s manufacturer boasts its camera can withstand being dunked underwater to depths of 12 metres for up to two hours, temperature as low as minus 10°C, being dropped from 1.5 metres in height, plus a weight equivalent to 100kg being placed on top of it. As you’d imagine, the lens here is of the internally stacked variety, ensuring that at no point in its operation does it protrude from the body and potentially get into harm’s way. That said, this did mean that we very occasionally we experienced the end of our middle finger making it into shot when gripping the camera, as it doesn’t project outwards. Commendably the protective layer in front of the lens appeared impervious to finger smudges and smears however, while water appeared to run off the surface of the camera itself so that it didn’t need plenty of drying down after a dip. What’s harder to swallow perhaps than even the Pentax’s out there styling is the price. Whilst the WG-2 without GPS is a top-end but more readily justifiable £299, this version is a whopping £349, going by manufacturer’s suggested pricing – so almost the same price as one could alternatively buy an entry-level compact system camera such as the Olympus E-PM1 for. Though street pricing will inevitably be cheaper – and we found the WG-2 GPS version advertised for £270 online at the time of writing – you’ve got to really want the full package on offer in the case of the WG-2, as you are paying a premium for it. However, on top of this the camera recently picked up ‘Best Rugged Camera’ at the TIPA Awards, voted for by European tech journalists, so with the caveat that all opinion is subjective, this may prove an added cachet for you. We had the orange and black liveried version of the Optio WG-2 GPS iteration in for review, which is no less striking than the alternatives. With all the little stylistic details, such as the sloping and serrated edges, industrial style faceplate screws and ring of bulbs around the lens to be deployed ringlight fashion in the ‘digital macro’ mode (get as close as 1cm, albeit with a resolution drop to two megapixels), the camera certainly looks busy front on. Add in an AF assist/indicator lamp bottom right of the lens, slots for the microphone and a small rectangular flash bulb and all the essentials are here however, with said flash sufficiently far from the edge of the faceplate to avoid fingertips straying in front. Indeed, although slim enough in depth the camera is longer than many competitors, and more rectangular in shape, something that is to an extent hidden by the eccentric design. Dimensions are officially 61.5x122.5x29.5mm – so roughly the proportions of a smartphone, albeit one as imagined by Samsonite - while the camera weighs 194g, so it won’t feel like a dead weight in your jacket pocket or beach shorts. On the top of the camera is a hump for the GPS antenna, which again, amidst the unusual and busy styling is well hidden, while over at the other side are both recessed on/off button and lozenge shaped shutter release button. The latter has a subtly roughened surface to make it easier to operate with wet fingers. Press the power button and the Pentax WG-2 GPS blinks into life in just over a second, which is swift for any camera. There’s no wait here for a lens to extend from the body to its maximum wide-angle settings because it’s already at that setting. Give the shutter release button a gentle squeeze and via the rear plate LCD you can see the image momentarily adjust before a green AF point appears on screen to signal you’re ready to take the shot. Squeeze the shutter release button fully and there’s no discernable shutter delay, the screen briefly blacking out before freezing to display the captured shot for a couple of seconds before reverting to the live feed. Three quarters of the backplate is eaten up by that widescreen ratio LCD, which means that still images captured in the default 4:3 image aspect ratio are displayed with black bands left and right of screen - like watching an old analogue broadcast era sitcom on a HD TV. While the LCD picture is visible in bright sunlight it could do with a bit more contrast, thereby helping us to determine finer detail, like whether an image is properly pin sharp or a little soft. The button layout to the right of the screen offers a familiar array of options, but here the actual buttons are square-ish or rectangular rather than round – with the exception of the ‘OK’ button at the centre of the control pad. It may be just a stylistic thing on the part of Pentax, but these wider buttons with their subtle ridges ensure there’s less chance of a finger slipping in use. However, should you be wearing gloves of anything but the fingerless variety the buttons are still a little too small for comfortable and precise usage. From the top of the backplate then we have a sloping rocker switch for zooming in or out, though rather than utilising a toggle type action, its length necessitates that your thumb has to hop from one end to the other, or from wideangle to telephoto setting, to arrive at the focal length required. Hold the right hand edge down and the camera powers through the entirety of its range in three seconds. However do the same when recording video and we only get access to a digital zoom, the image visibly degrading as you get closer to your subject, which is a shame. Beneath the zoom lever is a self-explanatory playback button and below this again is a four-way control pad. Depress the upper edge of this pad to adjust the self-timer settings, press its right edge to select macro/close up option, the bottom edge to call up the selectable shooting modes in the absence of an actual shooting mode dial or the pad’s left hand edge to access the camera’s flash settings. Press the ‘mode’ portion of the pad and the user is presented with an array of shooting options illustrated by colourfully cartoon-ish icons, with Auto Picture mode, which compares any scene with 16 on-board pre-sets and hopefully chooses the most appropriate, the default setting. There are 27 other combined shooting and scene modes to choose from. It’s here you can find the digital microscope mode and also the video shooting mode, as we don’t actually get a dedicated video record button here. Instead video needs therefore to be selected from among the shooting modes, whereby the image fills the width of the screen, recording commencing (and ending) with a press of the shutter release button. A final trio of backplate buttons is equally self-explanatory: we get a menu button – with options overlaid on screen – face detection/smile detection mode button plus a dedicated delete button for dispatching duff shots, which is always useful. The left hand edge of the camera, if viewing it from the LCD side, incorporates a stiff-feel, catch protected, slide open and raise door protecting two ports – for HDMI and AV/USB output. While on an un-toughened camera the fact that it is a little bit of a struggle to access the Pentax’s ports and cavities would be a pain in the backside, here we’re actually left feeling reassured that the camera won’t accidentally flap open at the worst possible moment. Over at the right flank of the camera is a chunky industrial looking lug for attaching the equally chunky carabiner strap for mountaineering types, which is provided in the box in lieu of a dainty wrist strap. The base of the Pentax WG-2 GPS features a screw thread for attaching the camera to a tripod on the cusp of one edge, rather than the usual centre positioning, while towards the opposite edge and taking up roughly half of the entire base is a sliding door protecting the joint rechargeable 260-shot lithium ion battery (a fair if hardly ground breaking performance) and SD card compartment (incidentally compatibility with Eye-Fi cards is also included). This again has the requisite protective catch and stiffened feel to its opening/closing ‘action’- indeed you almost have to force it open and shut. Generally speaking the build quality of the Pentax WG-2 GPS feels high and it certainly gives off the impression of being able to live up to its nigh destruction proof billing – more so than many of its cheaper but also more obviously plastic-y rivals. However while the camera was still functioning after being taken for a dip we did find beads of moisture had formed beneath the bottom battery and card cover at its outer edge, while the same was true of the HDMI/AV port at the side. So while keeping out most water, it’s obviously not completely impervious.